Department of Medical Laboratories, College of Applied Medical Sciences, Qassim University, SAUDI ARABIA. Department of Basic Health Science, College of Applied Medical Sciences, Qassim University, SAUDI ARABIA. Department of Optometry, College of Applied Medical Sciences, Qassim University, SAUDI ARABIA. Crocus sativus is a member of iridaceae family and its use in health management is in practice since ancient time. Additionally, research based on clinical trials and animal models have advocates its role in disease cure without any severe adverse complications. The aim of this study is to summarize the study of saffron and its ingredients based on in vivo and in vitro and role in disease cure and prevention. This study was designed through the search engines such as Pub Med, Scopus and Google Scholar. The keywords used for the search were mainly focused on Saffron with health benefit and its therapeutics role in different diseases. Saffron stigma is mixture of various components and recent studies have proven that saffron and its active ingredients play a key role in disease management. Moreover, clinical trials based study on the use of saffron and its individual components have confirmed the health promising effects. Although Saffron has potential role in the disease cure and prevention via modulation of anti-oxidant, anti-inflammatory, anti-tumour, anti-microbial and anti-diabetic activity. Furthermore, advanced research is needed to elaborate the role of saffron in health management and its mechanism of action in the modulation of biological activities. Crocus sativus is a member of iridaceae family and its use in health management is in practice since ancient time. Saffron stigma is mixture of valuable components including crocin, crocetin and safranal. Research based on clinical trials and animal models have advocates its role in health management without any severe adverse complications. Additionally, it also shows role in tumour management through modulation of cell signaling pathways. Saffron is a spice of Crocus sativus (Saffron crocus) which belongs to the family of iridaceae1 and studies has advocates its role in diseases cure. Its health management properties have been discussed in traditional prescriptions including Chinese, Ayurveda and Unani medicines. Crocus sativus has been reported its role as sedative, expectorant, anti-asthma, emmenagogue, and adaptogenic agent.2 Different plant parts like peels, fruits, seeds and rind of Crocus sativus contain various biochemically active ingredients such as crocin, crocetin, and safranal in different proportion. These constituents have demonstrated the health promoting effect through the modulation of various biological and physiological processes. Earlier studies reported that saffron is safe at various doses and did not show any severe side effects. Saffron aqua extract and pure crocin were safely tolerated in patients with schizophrenia.6 Study bases on evaluating the lactating toxicity and histological studies confirmed that saffron did not show any toxic effect on liver.7 This review is aimed to discuss the pharmalogical activities of saffron as an antioxidant, anti-inflammatory, hepato-protective, cardiprotective, anti-diabetic and anti-tumour activity along with safe dosage levels based on clinical studies. The exact mechanism by which saffron and its constituents demonstrate the therapeutic role in diseases prevention is yet to be fully elucidated. Laboratory based research has revealed that saffron constituents modulate the activity of various enzymes involved in free radical scavenging. Moreover, these components reduce the lipid peroxidation and enhance the antioxidant status. Stigma ethanolic fraction of saffron showed the highest antioxidant activity that might be recognized due to the presence of phenolics and flavonoids.3-14 Other experimental data advocates that saffron helps in reduction of inflammation through the inhibition of cycoloxygenase enzyme activity. Saffron alleviates neuropathic pain via reduction of proinflammatory cytokines, antioxidant activity and apoptotic pathways15 and in vitro study has revealed that crocin possess dual inhibitory activity against COX-1 and COX-2 enzymes.4 Saffron also shows a very important role in the tumour prevention and some findings advocate that saffron and its constituents induce apoptosis or change the ratio of bcl2/bax and finally inhibiting the development and progression of tumour. The imbalance between reactive oxygen species (ROS) production and antioxidant level is directly linked to the pathogenesis of diseases. The enhancement of antioxidant level or reduction of reactive species level is maintained through antioxidant properties of plants or their derivatives. Natural products or derivatives of medicinal plants usually contain various components including flavonoids which show a pivotal role as antioxidants and free radicals scavenging activity. Numerous studies based on in vivo and in vitro have confirmed that Crocus sativus has a significant antioxidant activity Table 1. 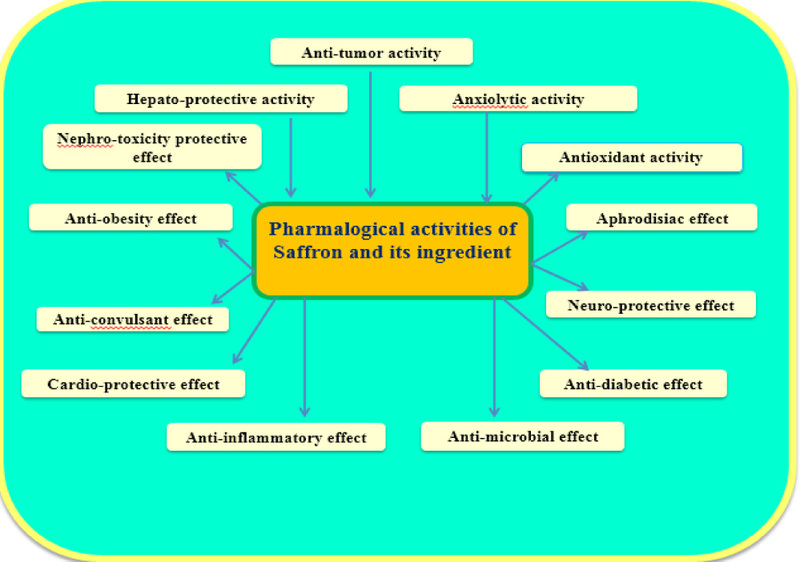 Pharmalogical activities of saffron and its constituents. Antioxidant Evaluation of antioxidant activity of stigmas extract Saffron stigma showed antioxidant activity. Antioxidant Measurement of antioxidant Antioxidant activity has been observed. Anti-inflammatory Effects of crocin, safranal on local inflammation Study finding reported that crocin and safranal showed role in the suppression of inflammatory pain responses and decreased the number of neutrophils. Anti-inflammatory Anti-inflammatory effects of crocin Crocin, a constituent showed anti-inflammatory effects and modulate inflammatory processes. Antibacterial C. sativus extract tested against bacteria. Strong activity of against bacteria and fungi was noted. Hepatoprotective Evaluation of protective effects of extract against hepatotoxicity Finding demonstrated that petals ameliorate acute liver injury. Protective effect against nephrotoxicity Effect of safranal against nephrotoxicity Safranal has a protective effect against nephrotoxicity. Cardio-protective Cardio-protective effect of saffron and safranal. Result revealed that myocardial injury preserved nearly normal tissue architecture with saffron or safranalpretreatment. Inhibitory action on AChE Inhibitory action on AChE via saffron extract and its constituents. Result indicated that Saffron extract showed moderate AChE inhibitory activity. Anti-hyperglycemic Saffron, crocin and safranal effects on the blood levels of fasting glucose, HbA1c and liver/kidney function tests Result demonstrated that saffron extract, crocin and safranal significantly reduced the fasting blood glucose levels but significantly increased the blood insulin levels in the diabetic rats compared with the control diabetic rats. Anti-obesity and anorectic Effects of saffron and crocin on body weight, food intake and blood leptin levels. Result concluded that saffron has anti-obesity and anorectic effects and lowered leptin levels. Anti-obesity Evaluation of anti-obesity effects of saffron and crocin Result showed that saffron extract significantly decreased food consumption in obese rats. Furthermore, crocin showed a significant decrease on rate of body weight gain. Aphrodisiac activities Aphrodisiac activities of stigma and safranal and crocin. The study results revealed that aphrodisiac activity of saffron extract and its constituent crocin. Anxiolytic properties Evaluation of anxiolytic and hypnotic effect of saffron extract, crocin and safranal. Results confirmed safranal at higher doses demonstrated anxiolyticeffects whereas crocin did not show anxiolytic properties. These days the popularity of alternative medicines based treatment is gaining much interest in the health practice. Saffron has shown its role in disease prevention and treatment and its importance in disease cure have been documented. Moreover, it is believed to be a safe and its adverse effect was not noticed at various doses. In addition, mortality was not noticed in animal model experiments at different dosage of individual ingredient of saffron. The role of saffron including crocin and crocetin in the management of numerous diseases has proven via modulation of various physiological and biochemical pathways. Saffron has also been reported to exhibit an anti-tumour effect through inactivation or activation of different molecular cascades. Research based on animal models and clinical trials are further needed to expand the understanding of saffron and its constituent’s role in diseases prevention. The authors are thankful to College of Applied Medical Sciences, Qassim University, Saudi Arabia for providing the facility to design this work. Rahmani AH, Al-Zohairy MA, Aly SM, Khan MA. Curcumin: A potential candidate in prevention of cancer via modulation of molecular pathways. Biomed. Res. Int. 2014;761608. Dr. Arshad Husain Rahmani: is working as an Assistant Professor in the Department of Medical Laboratories, College of Applied Medical Sciences, Qassim University, Kingdom of Saudi Arabia. His research interests include measurement of the therapeutic potential of natural compounds in the management of diseases and expression pattern of the genes linked to cancer development and progression. Currently he is working on research projects funded by Research Scientific Deanship, Qassim University and National Science Technology Innovation Program of Ministry of Education (NSTIP), Saudi Arabia. He has published more than 37 research and review article, of international repute. Besides this, he is an active reviewer of several ISI /Pubmed indexed journals. 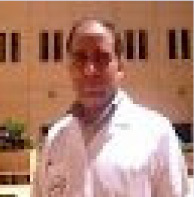 Dr. Amjad Ali Khan: Is currently working as an assistant professor in the Department of basic health science, College of Applied Medical Sciences, Qassim University, Saudi Arabia. He is actively involved in academics and research activities. Besides this, he is interested in research activities like antioxidant role of different medicinal plant extracts and their anti diabetic properties. In addition, the author as a team member is involved in research activities related to cancer induction and expression analysis of different sub cellular pathways. Yousef Homood Aldebasi: Is Professor of Optometry and the Dean of College of Applied Medical Sciences, Qassim University, Saudi Arabia. His research interests include vision sciences and implications of natural compounds in the prevention and treatment of diabetic retinopathy. He is involved on various research projects funded by Research Scientific Deanship, Qassim University and National Science Technology Innovation Program of Ministry of Education (NSTIP), Saudi Arabia. 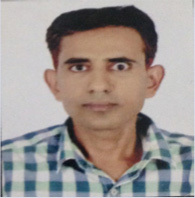 He has published more than 50 research and review article in international repute journal and presented several papers in national level and international level. Copyright statement: Copyright © 2017 Phcog.Net.